Nicole M. Thompson ARNP has joined the practice of Associated Coastal Ear, Nose & Throat Physicians PA. She brings 20 years of advanced training in the specialty of Allergy, Asthma & Immunology. She can perform skin testing to evaluate environmental, airborne and food allergies.She also treats allergic skin conditions such as eczema and chronic urticaria. She is trained in antibiotic skin testing for drug allergy evaluation. Mrs. Thompson is a certified asthma educator with advanced training in performing and interpreting Pulmonary Function testing for the evaluation and treatment of Asthma. 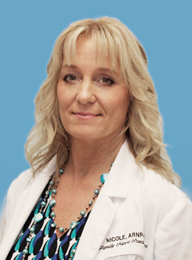 She has experience in Xolair therapy for Asthma and Chronic Urticaria. She evaluates and treats recurrent infections. She is experienced with SQIG and IVIG gamma globulin replacement therapy. In addition, she also performs well visits such as school and sports physicals and is able to treat same day sick visits for upper and lower respiratory infections. Mrs. Thompson received her Masters degree at Florida Atlantic University as a Family Nurse Practioner. She is Board Certified by ANCC. She is a member of the American Academy of Allergy, Asthma & Immunology. Prior to becoming a Nurse Practitioner, she specialized in Emergency, critical care and surgical care nursing. Over 60 million people in the United States suffer from allergies and the number is rising. Allergies are hypersensitive reaction of the immune system toward a natural substance such as dust, animal dander or pollen. This over reaction causes chronic and sometimes debilitating symptoms such as runny nose, nasal congestion, itchy watery eyes, asthma and skin disorders. Same day allergy skin testing with extreme accuracy done in our centrally located offices under close observation. You can leave our office knowing exactly what you are allergic to. On occasion, coordinating laboratory services may be ordered. Avoidance measures, prescribed medication such as antihistamines, decongestants inhaled nasal steroids, asthma inhalers and other anti-inflammatory medicines are recommended for patients, but when enough relief isn’t obtained Allergy immunotherapy (Allergy Shots) may considerably reduce and in some cases completely remove allergy symptoms. This is known as allergy desensitization and can last for many years. Allergy shots is the only treatment that targets the underlying cause allergies and alters the natural course of the disease.